“The main character, Petrushka, beats everyone with a stick, including the overseas hero — U.S. President Barack Obama. The script calls for Obama to shout: “Sanctions! Sanctions against Russia!” for which he gets smacked in the head by Petrushka,” Yevgeny Golovin, the organizer of the show, said in his comments to regional news site Sibinfo.su. At the end of the show, children will have the opportunity to participate in the burning of the Obama-puppet. 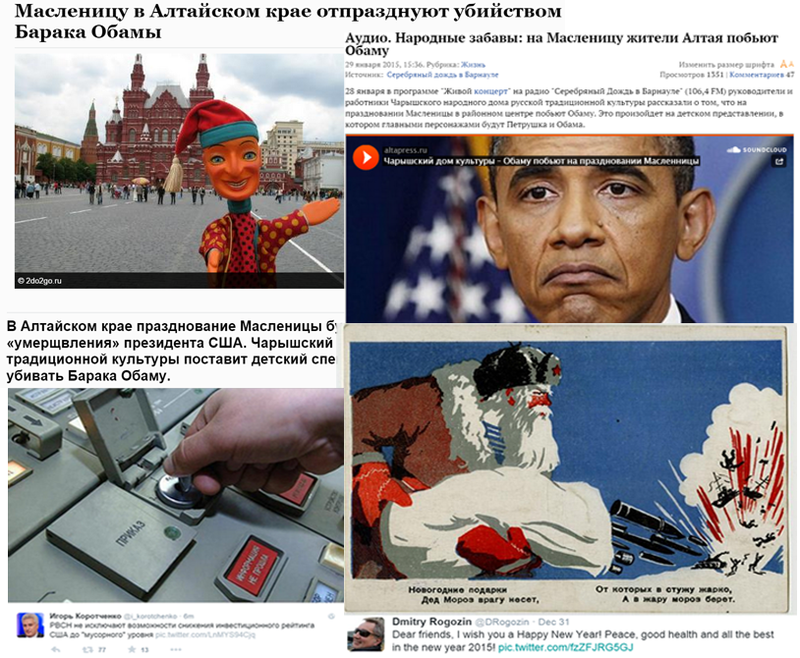 In addition to Obama’s theatrical murder, children will be greeted with Russian singing, pancakes and “manly” amusements. This year’s Maslenitsa celebration will take place on Feb. 16 through Feb. 22, 2015. Russia’s growing hostility towards the West is undeniable. It is complete with nuclear saber-rattling by the Editor-in-Chief or Russia’s National Defense magazine, Igor Korotchenko and Deputy Prime Minister of Russia Dmitry Rogozin’s New Year’s greeting that featured Russian Santa Claus bombing people out of his gift sack, spilling out “surprises” that would give Russia’s enemies “heat during winter and chills in summer time.” Russia’s chief spin doctor, Dmitry Kiselev, boasted on-air that Russia is the only country “genuinely capable of turning the US into radioactive ash”. Russia’s antagonism isn’t limited to aggressive word games. On Jan. 27, 2015, British war planes were scrambled to intercept two Russian “Bear” long-range bombers capable of carrying nuclear missiles, as they flew south of Bournemouth, forcing British authorities to divert civil aircraft. Britain summoned the Russian ambassador to address what could be seen as an act of aggression and a significant escalation by Russia. Last year, NATO has conducted over 100 intercepts of Russian aircraft, which is about three times more than those performed in 2013. In 2014, Russia launched a mysterious object into space. Recent orbital maneuvers of “Object 2014-28E” have raised concerns that the satellite may be utilized as a space weapon. With its economy and international standing in shambles, Russia is primed to become the world’s pariah, akin to North Korea. Perhaps Vladimir Putin will discuss his bullying tactics with the North Korean leader, Kim Jong Un, during his upcoming trip to Russia. [UPDATE] Negative publicity forced the theater to re-write the script for the upcoming show. New plans for the upcoming performance are yet to be revealed.